Belgian educationist and writer; born Sept. 9, 1827, at Breisach, Baden, Germany; educated at the Progymnasium of Breisach and at the polytechnic school and the pedagogic seminary of Carlsruhe. After occupying the position of teacher in his native country and at the Jewish school of Hegenheim, Alsace, he was called to Brussels as principal of the Jewish school there (1855). 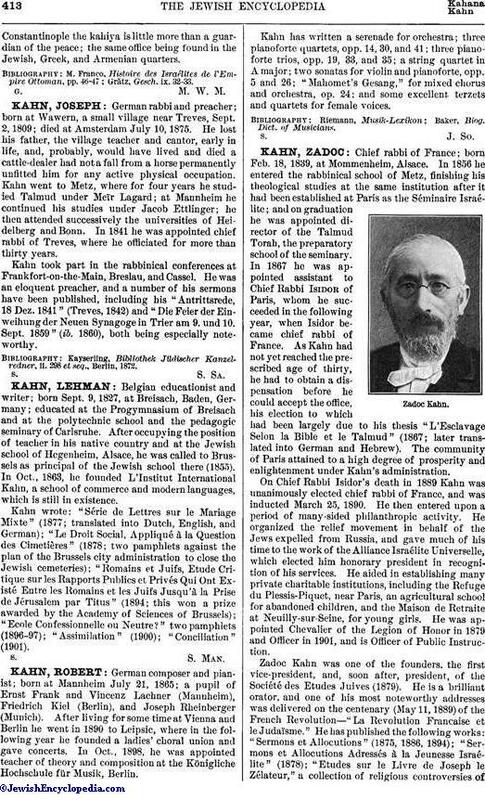 In Oct., 1863, he founded L'Institut International Kahn, a school of commerce and modern languages, which is still in existence. Kahn wrote: "Série de Lettres sur le Mariage Mixte" (1877; translated into Dutch, English, and German); "Le Droit Social, Appliqué à la Question des Cimetières" (1878; two pamphlets against the plan of the Brussels city administration to close the Jewish cemeteries); "Romains et Juifs, Etude Critique sur les Rapports Publics et Privés Qui Ont Existé Entre les Romains et les Juifs Jusqu'à la Prise de Jérusalem par Titus" (1894; this won a prize awarded by the Academy of Sciences of Brussels); "Ecole Confessionnelle ou Neutre?" two pamphlets (1896-97); "Assimilation" (1900); "Conciliation" (1901).